"The world's first interactive dancing game is finally here and EyeToy Groove is guaranteed to get all gamers grooving!" 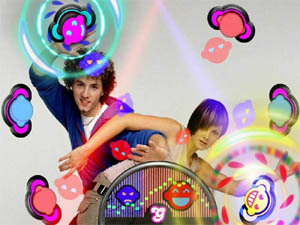 EyeToy Groove is the latest addition of the EyeToy gaming series that once again puts gamers in the role of movie and music star. The original EyeToy gaming bundle is probably one of the best selling PlayStation 2 accessories in Australia that even took Sony Australia by surprise because it was sold out almost everywhere. For those that don't know or for those hiding in caves, EyeToy is a small camera device that plugs directly into the USB port of the PlayStation 2 that allows players to star in their own computer games and also manipulate the gaming environment without a controller. 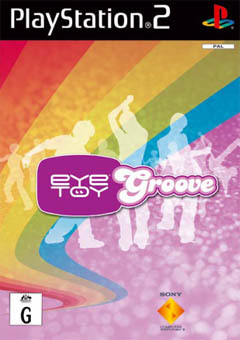 EyeToy Groove (now known as Groove for this review) is a little different than its predecessor as this collection contains a variety of music and rhythm based games. In order to play this title, gamers will have to purchase the original EyeToy device because without it, it is impossible to play this title. The installation of the EyeToy is extremely easy and it simply just plugs directly into a spare USB port on the PlayStation 2 (located on the front of the console). Once the EyeToy is connected, you must configure the device so that you appear directly in the centre of the screen. This allows the gamer to be seen on the television and interact with the gaming environment to appear if that they are actually in the game. As with the previous game, this current incarnation also features a tutorial on how to maximise your EyeToy experience. The gameplay in Groove isn't really a game about "skill" or "achievement" but more about having a great time. I should also mention that this game is strictly not a single-player game because without some friends around, the game itself becomes extremely repetitive. 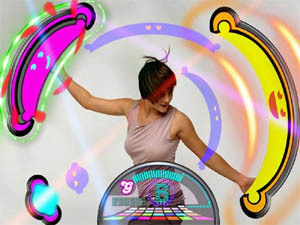 In its purest form, Groove is a party game that contains a variety of music style games such as using your body to touch lights, moving objects on the screen and of course dancing. The learning curve of Groove is almost immediate because of the simplicity of the title. The control system of the game required no DualShock controller, lightgun, dancing mat or any other device because all you use is your body and arms to help create elaborate patterns and perform a variety of other funky disco style moves. Although the game is mainly about having fun, there is also a slightly serious side to it and that is scoring points. Points are acquired by hitting certain objects in the game and the more accurate you are, the higher your score will be. The beauty of Groove is that it not only caters for gamers of all ages but also to people who would never even consider playing a PlayStation 2 title. Once these "non-gamers" see themselves on television, they will almost immediately become hooked. Another impressive feature of the title is the freestyle mode that allows you to either dance like John Travolta or like a an uncoordinated jellyfish. Graphically, Groove doesn't push the PlayStation 2 to its limits and uses a combination of psychodelic graphics with a variety of impressive lighting and blurring effects to give the title that true 70's disco effect. With fluorescent type bubbles, 3D digital type banana lights and a variety of other magical effects, the graphics of groove perfectly suit this entertaining game. The musical score of Groove is brilliant and uses a combination of disco sounding tunes with a variety of modern contemporary music from Madonna, Jamiroquai and even Elvis. The game itself contains over 19 different tracks from various artists, ensuring that a variety of musical tastes are catered for. There is also a plethora of other musical type effects that go hand in hand with the songs that grace this title. In conclusion, EyeToy Groove is a much more entertaining title than its predecessor and truly uses the camera to its advantage. With a brilliant "funky" sounding soundtrack and great gameplay, EyeToy Groove is the perfect party game, especially if your Christmas day is a little lack lustre. Check it out!